Sometimes your device can start running out of memory and this can cause unusual behaviour. If Equipd is crashing or locking up then it might be time to try rebooting your device. Once the device is totally off, hold down the power button for 3 seconds to turn it back on again; The Apple logo will appear in the center of the screen while it starts up again (second screenshot below). See if the problem still occurs in Equipd or if it is now fixed. If you restart your device following the steps above and are still having some issues then it might be time to perform a "hard reset". This is not wiping your device - it is just the next step of a reset where it completely wipes everything from RAM so that the device has a totally clean start when it powers on again. So … how to do a hard reset? First of all make sure you have at least 20% power on the device. 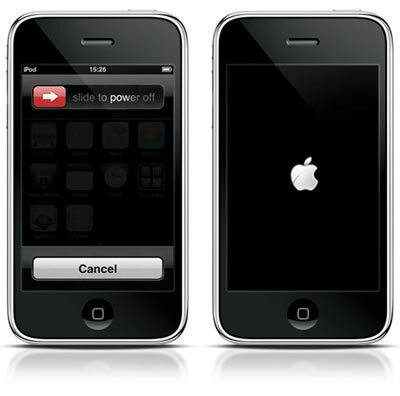 Next, instead of just holding down the power button, this time hold down the power button and the start button at the same time - and keep holding them until the white Apple logo appears in the middle of the screen (second screenshot below). Wait until the device starts up again.